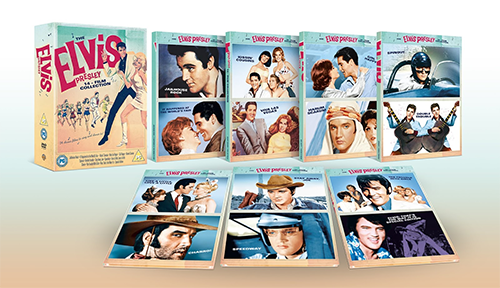 This carefully selected collection of films celebrating the cinematic output of the King himself, Elvis Presley, provides the perfect portrayal of the icon's unrivalled contribution to American rock'n'roll culture. These 14 timeless tales include portraits of the iconic, quintessential Elvis the world knows and loves with classics such as Viva Las Vegas and Jailhouse Rock, alongside characters you may not be so familiar with, like the gun-slinging anti-hero from the gritty western Charro. With countless special features, including trailers, remastered soundtracks, and behind-the-scenes documentaries, there's something for every collector, fan, cineaste and lover of rock'n'roll! Get swept away by the romance of It Happened at The World's Fair and belt out the blues as the ultimate rock'n'roll legend dazzles the screen again and again. Its really time to have the Elvis movie catalogue on blu ray. Whats the hold up? "With countless special features" - I counted eight of them (not counting the remastered soundtrack of the TTWII SE and the comeback of deleted songs) which could hardly be called countless. They weren't very special either, just a bunch of trailers and a TWII featurette.